These promotion Channels are especially for you who value both ethics and professional competence. They will enable you to see the larger picture and motivate your to strive for a better future. In Peacebird, there are the administration promotion channel and the profession promotion channel. You can choose one that best suits your post and work tasks and go ahead. Administration promotion channel: You can get promoted through leading and administrating a team and promoting your own administration performance and professionalism, realizing your career development. Professional promotion channel: You can get developed through focusing on your own profession, continuously developing your professional competency and achieving professional grades stepwisely. Throughout the promotion process, your department will formulate and implement a training plan in accordance with your conditions to support you, and the HR department associates will also facilitate your training. After training, the head of your department will evaluate your performance and submit an application for promotion to the HR department according to your training result. 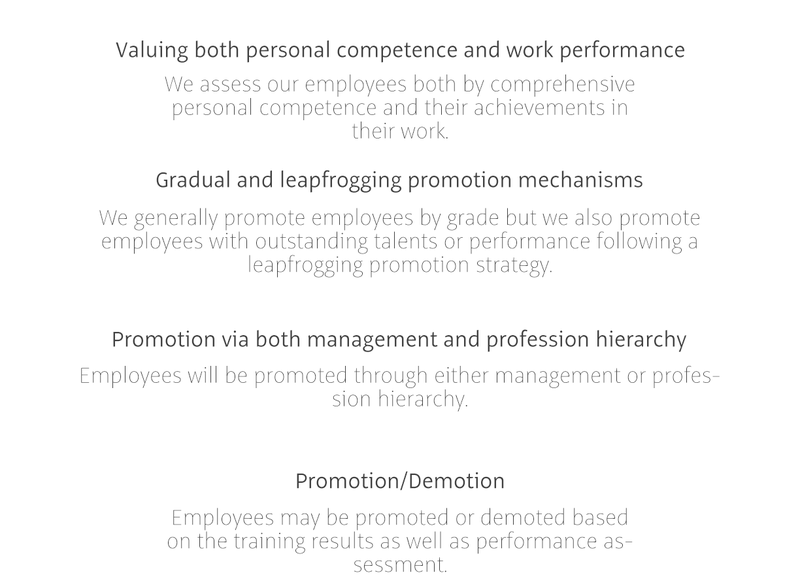 The HR department will make the final promotion evaluation.